Spring is here and brought with it the urge to make something lighter to wear in the milder weather! Categories: Minerva Craft Makes, Sewing | Tags: cowl, dressmaking, neck, simplicity 1716 | Permalink. Glad to inspire you to have another go at it, too! I love a bold, colourful print – makes me feel happy inside for some reason. How does that work, I wonder? Some of us just love colour! Thanks Robin, a good shape for a curvy girl, I agree! Hope all’s well with you and the family? OOOhh I like both of those! So perfect for Spring/Summer! Wonderful job! Thank you! My thoughts exactly – great for this time of year. Nicely done, Sheila. I like both versions. Your fabric choices are lovely too. Thank you, I do love a bold fabric, although it does mean you need a simple design to show it off properly. I shall make more of these, I’m sure. In this case, you show case the fabric over the design. I like that. You are so good at what you do and have an obvious love of fabric. I used to sew at a theater costume shop, and made most of my clothes growing up. I miss the time to do that. I’ve made costumes and slip covers in recent years, but it has been awhile since I made my self ready to wear clothing. I had a period of at least ten years when I didn’t sew a thing, so it was nice to get back into it eventually. Theatre costumes sound exciting – I’ve sewn for an entire dance school show once, but nothing fancy. Still, as I’m sure you know, it’s good to know you CAN turn your hand to anything if you need to, even if you diversify for a while. Sheila, thanks for sharing that. When I do sew I realize how much I’ve missed it. Theater costumes were a lot of fun. Everything tends to be bigger than life. In addition to sewing, you learn how to distress fabrics to make them look aged or damaged. It was joyful work. 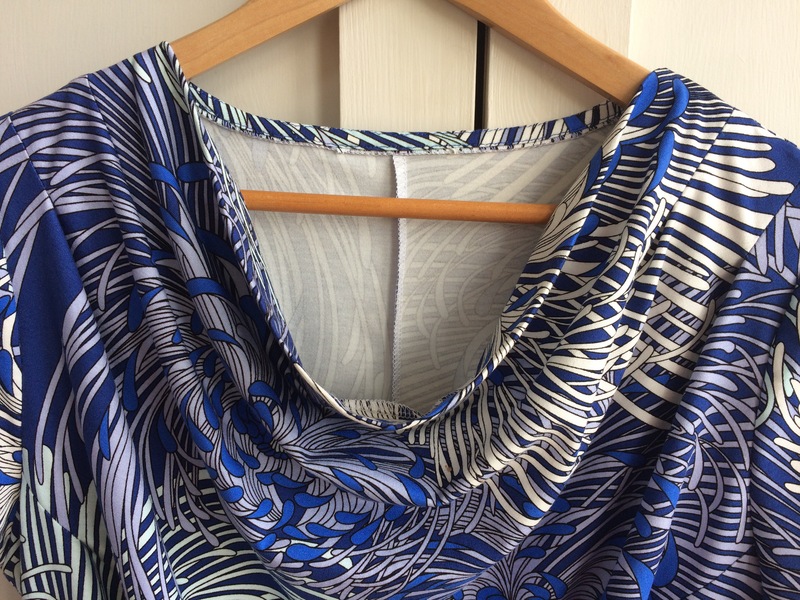 Such lovely fabric – love the blue/white print! It’s nice, isn’t it? Even better in the flesh as it’s such a smooth, soft fabric and drapes beautifully. This looks very good on you – that colour is a winner. I’ve had this pattern for ages – I meant to make the twist neck dress version for my daughter – thank you for the timely reminder. It’s a nice pattern to make up, so you’ll enjoy sewing it for your daughter, I reckon. I might have a go at the twist neck version, but I thought the cowl would be more flattering for my big bust. We’ll see. Thanks, I think a few more are definitely on the cards as it’s such an easy top to wear. Lovely dress fabric and pattern ~ all very flattering for you! Thanks so much for the details of sewing up that pattern. Thank you, I don’t wear a lot of blue, but I couldn’t resist this fabric.